For most tuners, there has, or will come a point when a street project becomes too excessive as a daily driver vehicle. 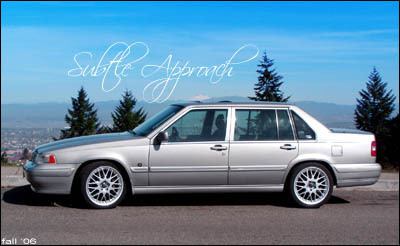 After 10 years of modifications Peter Linssen’s renowned 740 Turbo became just that. A rock hard suspension, exhaust note that would deafen the surrounding wildlife, and minimalist creature comforts are well suited for weekend blasts through the twisties, but not for Linssen. "On the long hard summer work days the last thing I wanted to do was to sit in traffic in the heat with no AC and a clutch that would make your leg ache,” he said. Enter this low-key 960 project that still rivals any sports car on the road today. A great benefit of having tried and tested modifications and performance options for a living was that Peter knew exactly what he wanted to achieve and could streamline the process right from the start. With performance as the priority his first step was to address the engine compartment. This 1995 960 rolled off the factory line with the first of the white block 6cyls, producing nearly 200hp. 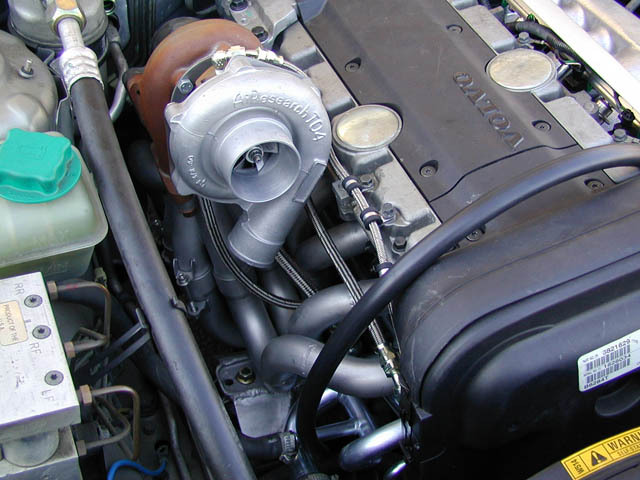 After years of driving what was now a dedicated race car on the street, Peter, in his words "… had become accustomed to a much higher power to weight ratio", and thus started the plans for turbocharging his ride. The easiest way he found to reach his 300+hp goal was to begin a transplant of the S80 T6 motor he located. A direct result of the recycling theories over at Volvo, the T6 mounted up in place of the stock motor with out many modifications. 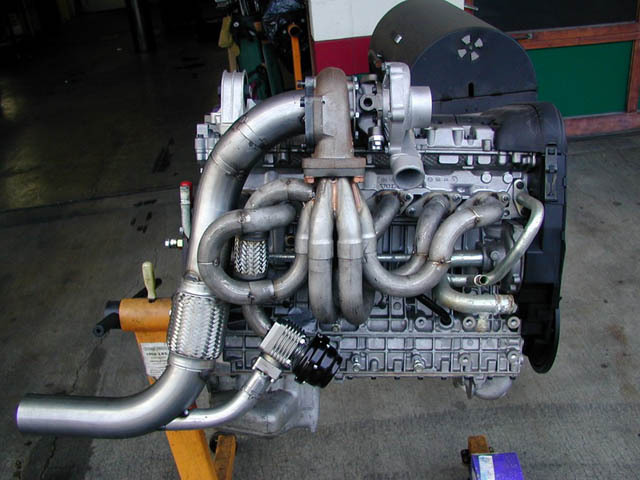 Design of the remaining pieces of this power house included a custom fabricated stainless exhaust manifold supporting a single T3/T04E from Cherry Turbos. 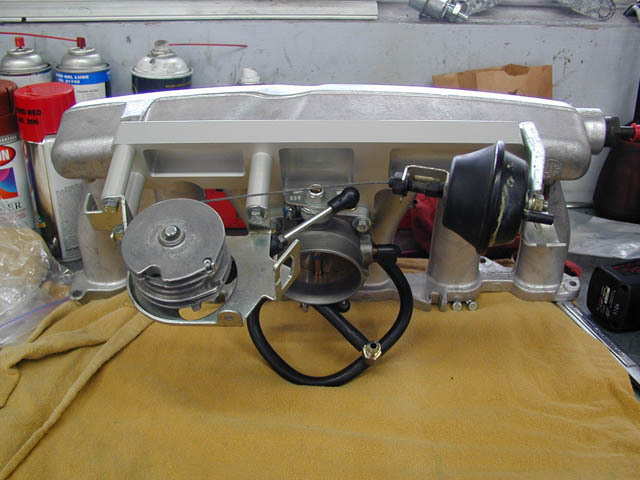 The stock Motronic 1.8 engine management system was left in place, however the larger injectors and additional control of a piggy back system from Split Second provided the fine tuning in order to correct the ignition and fuel maps to match the new motor. The turbo exits into a custom 3" downpipe that has been ceramic coated and a Tial waste gate was fitted to control boost. The rest of the exhaust remains 3" diameter and constructed with T304 stainless steel using V-band clamps. 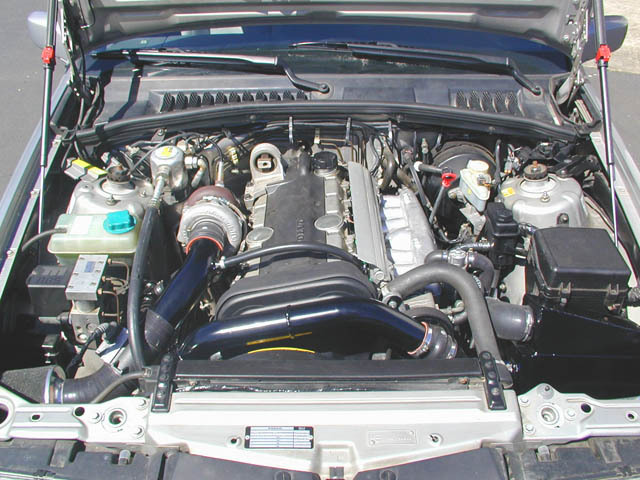 An RT MetalMatrix Catalytic converter and Magnaflow wide-open muffler completed the system. The suspension hurdle was difficult in this case due to the fact this car was designed as a daily driver, so comfort was definitely a factor. However, it had to be able to perform when commanded. Additionally the ride height was far from desirable for a car that would become an idol to all things sleeperesque. The solution was to have custom coils wound for the front retaining the stock spring rate but 1.5" shorter in overall ride height. The rear suspension was converted to the Nivomat self leveling shock setup - something most convert away from due to the difficulty in lowering it. In this case, Peter fabricated a lower mount for the shock that matched his desired -1.5" ride height and retained the function of the system all together. The final results provided -1º camber and +5º Caster up front with a 1/16" toe-in and a perfect 0 toe in the rear. The front brake system was overhauled with a pair of AP Racing 330mm drilled rotors and AP Racing 4 piston calipers using Hawk HPS brake pads. The final touch was the wheels - the centerpiece of this car’s visual appeal – at least at first glance. 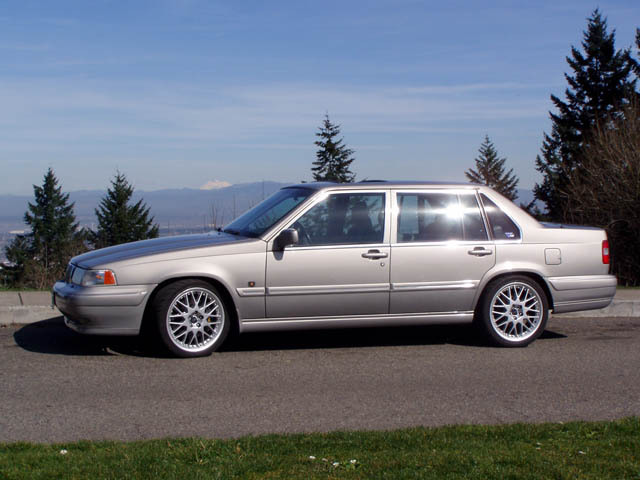 Keeping the OEM form but with style, a set of 18x8" BBS made Volvo Triton 2-piece wheels where bolted up with 225/40-18 Kumho Ecsta MX tires mounted on them. 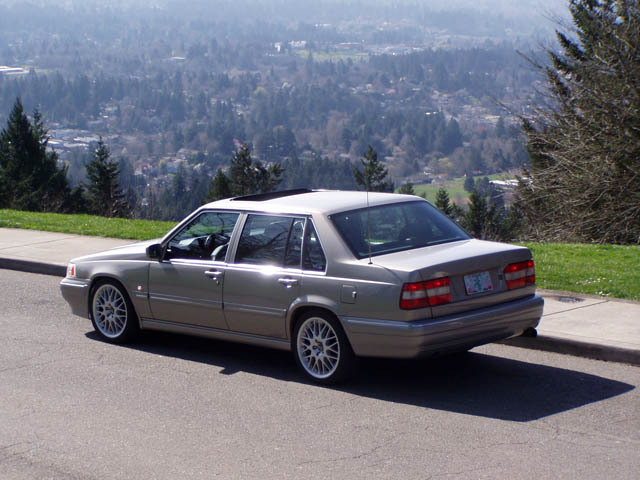 Now completed - for lack of a better word, Peter Linssen’s 960 is an accomplishment most of us would consider the ultimate daily driving machine. Worthy of praise from both style and performance critics, it’s a rolling icon for Volvo tuners world wide. A lot can be said about planning a project from the start, he said. "This is the first car where I built it exactly the way I wanted the car to be.” There are no errors in continuity here. In fact the only change that has crossed his mind would be to upgrade the suspension using the European "sport" package for better control under power while still retaining that "plush" ride around town. Motor: B6284FT from an S80 T6 swapped in with custom fabricated 6-1 321 stainless manifold using a custom Burns Stainless collector. Cherry Turbos’ T3/T04E Buick Grand National exhaust housing with a stage 3 turbine wheel, .50 trim T04E compressor wheel in a T04B housing. Exhaust is composed of a 3” ceramic metallic coated downpipe with a Tial external waste gate, followed by 3” T304 stainless steel tubing, a 3” SS Random Technology metal matrix catalytic converter, and a 3” SS Magnaflow straight through muffler. Latest dyno testing showed 290hp at the rear wheels. Transmission: OEM AW30-40 from the 960 modified with valve body and performance clutch kit from Level 10, plus a rebuilt torque converter. Suspension: Custom springs with stock spring rates lowered 1.5" up front. Nivomat auto-leveling suspension with 1.5" lower bottom mounts in the rear. Wheels & Brakes: 18x8" Volvo Triton BBS 2-piece wheels with 225/40-18" Kumho Ecsta MX tires. AP Racing 330mm drilled rotors and AP Racing 4 piston calipers with Hawk HPS pads up front, and stock brakes with PBR metal master pads in the rear. Interior: : The standard interior is unchanged except for the addition of an Omori boost gauge. The stereo has been upgraded to a system from a Volvo C70 coupe. Running the show is a 3-disc in dash head unit with Dolby surround sound, assisted by an external Dolby processor and an external amplifier.